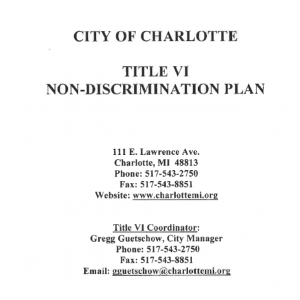 The City of Charlotte Tax and Assessing database is hosted on another website. To access this information, please click this link. The site will open in a new window or tab. Information about the Board of Review, including a schedule of its meetings, can be found by clicking this link. The property tax assessment appeal process is a mystery to many. If you follow these simple steps, it will eliminate some of the confusion in deciding whether or not to appeal and help you prepare valid information for a successful appeal. Step 1. Prior to making an appeal to the Board of Review, it is important to understand what the appeal process is and what it means to you. Your first step should be educating yourself by reading this. Step 2. If you have decided to continue with your appeal after reviewing the information in Step 1, you will need to complete the petition and bring it to your hearing. Step 3. Now that your petition has been completed, you need to schedule a time for your appeal. You can schedule your appeal by sending an email to SOsborn@charlottemi.org or by calling 517-543-8844. Step 4. Prepare for your appeal. Appeals are limited to 5 minutes each so it is important to use your time talking about issues that the Board of Review can address. Refer to the information provided in Step 1 for tips on how best to prepare for your appearance before the Board of Review. Summer property taxes are due in the Treasurer’s Office by 5 p.m. on August 31st. Winter property taxes are due in the Treasurer’s Office by 5 p.m. on February 14th. There is a 24-hour drop box located behind city hall at the corner of Washington and Harris. How long does it take between a tree investigation and the recommended work? Under normal circumstances, work will be completed in the same year a request is taken. Maintenance trimming is generally done in the winter months when the tree is dormant. Emergency work is always done as soon as possible. Does the City accept credit cards for payment? At this time, Charlotte does not accept credit card payments. VISA/Mastercard charges its customers an interchange fee of approximately 3%. On a $1,000 tax bill, the city would have to pay approximately $30 to the credit card company and that money would have to come out of general fund operations. There are municipalities that use credit card companies, but they charge the customer a “user fee” equal to the 3% interchange fee. You would have to pay the fee and the full tax bill. We have investigated this service, but have discovered through talking to other municipalities that it is seldom used. The Treasurer’s office accepts cash and check payments only. I need a copy of my paid receipt. Where can I get one? The Treasurer’s office can provide you with a copy of your paid tax bill. You can also access this information by clicking “On-line Assessing/Tax Services” on this website. You can access your property by owner’s name, address or parcel number. The site has tax information back to 2001 and will show dollar amounts and dates paid. Who receives the funds from my tax bill? SET (State Education Tax) -The State Education Tax Act was one of several components of Proposal A of 1994 that changed the way in which elementary-secondary education is funded in Michigan. The State levies the state education tax statewide at a six-mill rate on all real and tangible personal property not otherwise exempt from the property tax. This millage is distributed to the county treasurer who then forwards it to the State of Michigan. CHAR SCH DEBT (School Debt) – Special elections are held to enable schools to levy millage for such things as school construction or renovation. This line item could be a combination of several elections the school district has had over the years. Please contact the school district for more detailed information on their debt millage. This millage is distributed directly to the school district. CHAR SCH OPER (School Operating) – This millage is another component of Proposal A of 1994. Under the proposal, a school district can levy 18 mills for school operating purposes. An exempt principal residence is not subject to the levy of school operating millage. For the majority of Charlotte taxpayers, this line item will be zero as your property is your principal residence and it is exempted from this tax. Businesses, rental properties and people owning multiple properties will pay the school operating millage. This millage is distributed directly to the school district. Besides the City, your tax bill is remitted to Charlotte Public Schools, Eaton Intermediate School District, Charlotte Public Library and Eaton County.